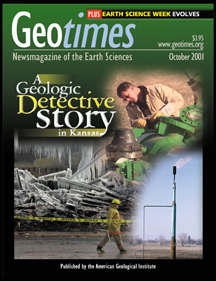 On Jan. 17, a series of explosions in downtown Hutchinson threw the Kansas Geological Survey into the limelight as its geologists hunted for the explosions’ source. Chances are, someone near you is hosting an event to celebrate earth science this month. Now four years old, Earth Science Week is moving forward on its own momentum. Earth science friendly Web sites. Geomedia's popular On the Web links are now available by topic! Moon formed from older Earth? Law makers must consider technological and scientific issues every day. But do they have enough information to make the right decisions? On Oct. 25, school children will watch a live broadcast as paleontologists study fossilized dinosaur skin, a surprise find from Utah. ON THE COVER: A montage of images from Kansas after a series of natural gas explosions hit Hutchinson Jan. 17. From bottom left to top right: A firefighter walks past ice-covered wreckage (AP Photo); controlled releases of gas after the explosions (Kansas Geological Survey); checking gas line pressures (The Hutchinson News). See story.